I had spent the day reading the “Black Panther of Sivanipalli” by Kenneth Anderson, the great hunter of Scottish origin who had settled in India and whose books are hailed as classics of jungle lore. Towards evening I engaged myself spotting the flying beauty plum headed parakeet and the stork billed king fisher. All of a sudden, in the evergreen forest to my left bordering the resort, I noticed the “horns” with a distinctive elliptical cross-section at its base, a characteristic that is strongly male. I leaped down from the machan where I was watching the birds and ran about 800 m in the direction of the horns I spotted. 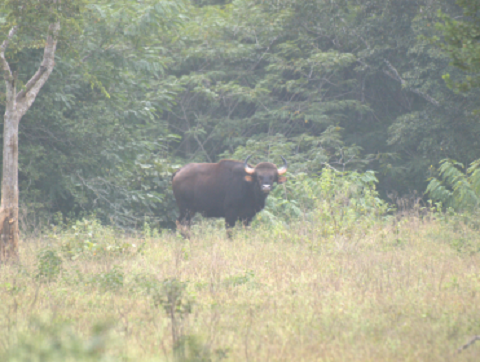 I could not get a clear view of where the beast stood, and when I did find him, to my surprise I found that he was a gaur or the Indian bison and was looking in my direction. It seemed as if he was noticing my actions for quite some time now. I quickly tried kneeling to hide myself. 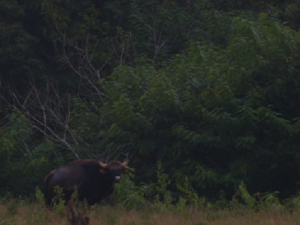 Gaur herds are usually led by an adult male. Though I knew adult males are usually solitary I looked to find more of them. I raised my head slowly and spotted more heads with horns that were more slender and upright with a more inward curvature and the ridge also was scarcely perceptible, these were the female gaurs and there were four of them. With the camera in my right hand and holding the branch in one hand I began taking pictures, but after clicking a couple I realized the light had become dull as it was just about 20 minutes to sunset. I tried using the flash light but he had immediately noticed it. He stopped grazing and turned toward me and charged in my direction. I jumped down the tree I was sitting on since it was at a height of just about 3-4 metres which was easy for him to reach with him horns. 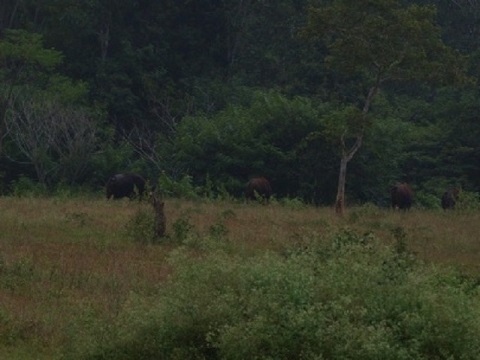 I rushed toward the machan and decided to take a few long shots. He stood at the distance looking in my direction till I had ran out of his sight, he then shook his head several times bending to and fro as a warning not to enter his territory or disturb his family.